If you want to build some muscles or just simply train for fitness, it is a very good idea to supplement your body with some protein supplement like the Gold Standard Whey or Body Fortress. Protein is needed for building new cells and body tissue. That’s why you need to enhance your body with extra protein if you want to develop real muscles. Some protein supplements also help in improving your body’s recovery rate and energy levels. 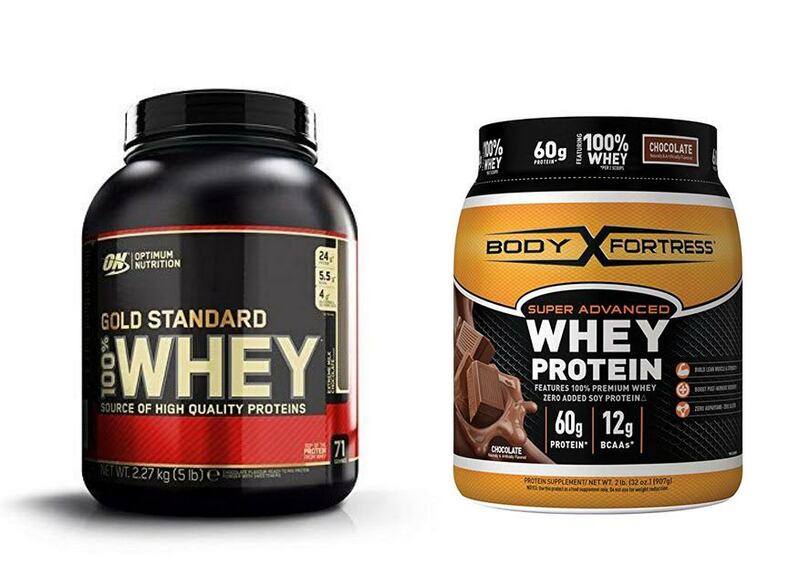 Gold Standard Whey and Body Fortress are among the most popular protein supplements on the market – which one should you choose? Gold Standard Whey is the pricier product out of the two. Gold Standard Whey is enhanced with 24 grams of protein, over 4 grams of glutamine and glutamic acids, and over 5 grams of naturally occurring Branched Chain Amino Acids (BCAA) featuring Leucine, Isoleucine, and Valine in each serving. The total calorie content is 120 calories. The primary ingredient of Gold Standard Whey is whey protein isolate, and the whey protein microfractions are derived from whey protein isolates and ultra-filtered whey protein concentrate. Gold Standard Whey claims to be effective for muscle recovery and muscle growth, while boasting the easy-to-digest protein formula. It is recommended to be consumed after workout. Gold Standard Whey has also been praised for the nice taste and texture. It is available in at least 27 flavor choices, so there are plenty of options here. Even though Body Fortress is more affordable, it actually contains more proteins and amino acids than Gold Standard Whey. Body Fortress boasts 60 grams of protein and 12 grams of BCAAs per two scoops. The BCAA complex includes 6 essential and 9 non-essential amino acids. The product has been reinforced with the Body Fortress Super Recovery Blend, too, which contains L-Glutamine, Creatine Monohydrate, and Taurine. You can choose whether you want to take just a scoop or two per serving. Body Fortress is beneficial for supplying proteins and amino acids to your body, at the same time improving the recovery rate. However, Body Fortress is only available in six flavor choices, which are chocolate, strawberry, cinnamon swirl, vanilla, cookies n’ crème, and chocolate peanut butter. Just like Gold Standard Whey, Body Fortress is recommended to be taken post workout. In the end, we suggest you choose Body Fortress. It has higher levels of proteins and amino acids, so it is more nutritious to your body. The recovery blend also helps your body to recover more quickly. Meanwhile, Gold Standard Whey can be the alternative if you want more flavor choices.